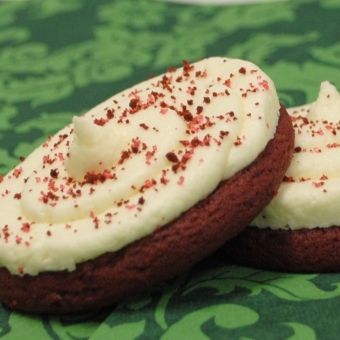 Our Red Velvet Sprinkle is a soft shortbread cookie with a mild chocolate flavor complimented by our rich, creamy cheesecake frosting. It is delicious any time of year, but most popular during the Holidays! Size: -- SELECT -- Red Velvet Sprinkle 10 ct.Red Velvet Sprinkle 20 ct.Red Velvet Sprinkle 30 ct.Red Velvet Sprinkle 60 ct.Red Velvet Sprinkle 90 ct.